The Springtail EFV-4B Personal Air Vehicle (PAV) is a fourth-generation vertical take-off and landing (VTOL) craft powered by a single engine. A single operator flies standing erect; a pair of ducts about one meter in diameter contain the fans that provide vertical thrust. Each fan has three blades which are counter-rotating, eliminating the torque that you are probably worrying about (normally associated with single rotor designs). The Springtail EFV-4B is capable of a maximum speed of 113 miles per hour, with a hover ceiling of 11,400 feet. 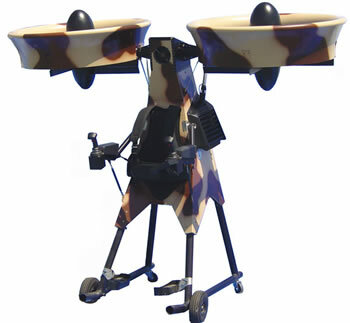 It can take off vertically, then fly horizontally, by shifting the angle of its rotors. The Defense Advanced Research Projects Agency (DARPA) awarded a $1 million grant in December 2000; the craft seen above is a photo of the latest working prototype (taken one month ago) to be used for further research and development. Wny did DARPA invest in this machine? The machine "allows a person to get three-dimensional in the battle space," explains DARPA exoskeleton program manager Ephrahim Garcia. See also Trek Aerospace for more information.